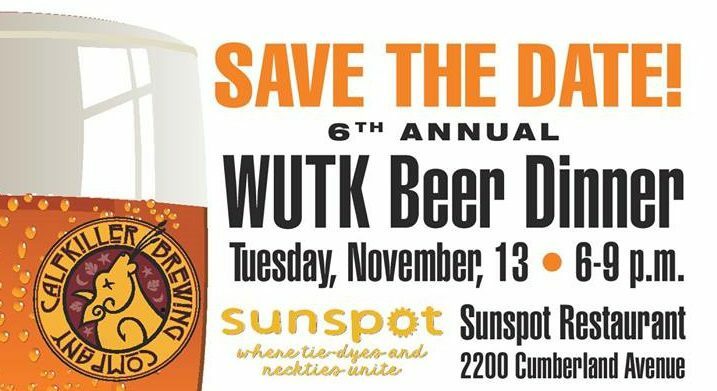 Come tickle your tastebuds and support college radio at the 6th Annual WUTK Beer Dinner at Sunspot Restaurant! Mark your calendars for Tuesday, November 13th from 6p-9p at Sunspot Restaurant at 2200 Cumberland Ave, and make your reservation TODAY (Sunspot phone #865-637-4663). Sunspot Restaurant will prepare a five-course meal, and pair each course with a delicious craft beer from CalfKiller Brewing Company from Sparta, TN. ALL PROCEEDS from ticket sales will benefit WUTK 90.3 FM. We’ll have valuable raffle prizes all night, including VIP Ice Bears tickets, UT Men’s Basketball tickets, UT Lady Vols basketball tickets, concert tickets, and more! Stay tuned to WUTK for more detailed information as it’s released!